Whenever we write in our worksheet, we have the chance to insert text. As we do this, the word on the right will move in that direction allowing the new text to be inserted. For example, lets imagine we want to introduce a word (new) between the words need and challenges on the text we wrote previously. As we write, we will notice that the word challenges will begin to move to the right to allow the word new to be inserted. Notice where the cursor is located on the image below. When we finish writing our word, we press the space bar on our keyboard and our new word will be inserted. There is another way to insert a word, it is called Overtype. By using this way, you would be writing over the words we have to the right of the cursor. This function is useful whenever we have made a mistake and we want to substitute the text for another entirely. The way in which we enable Overtype, is through our keyboard. We simply press the key Insert. However, this function must be enabled in Word for its proper function. 2. From the menu, select Word Options, which is used to customize basic and advanced tools. 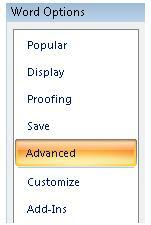 3.From this menu, we select Advanced. 4. Look for the option of use the Insert key to control overtype mode and we select both boxes. 5. Click OK and we will be able to use the key Insert in its overtype function. When this function is enabled in Word, whenever we press the key Insert, if we write, for example "more", it will delete the word on the right of the cursor as we move along.